On January 25th, L. T. Ives, Esq., of Detroit, at the request of the Governor, submitted to the Board a sketch prepared by him for a group of statuary designed to be placed in the central eastern or principal pediment of the building. Mr. Herman Wehner, of Bay City, had already prepared a model for the central figure of the group, by which Michigan is represented by a female figure in Indian costume, casting away the emblems of barbarism, a scalping knife and tomahawk, and taking up civilization and education as emblemized by a globe and collection of books at either hand. With this modification the Board adopted the sketch of Mr. Ives, whose generosity and artistic skill were acknowledged by the Commissioners by a resolution of thanks which was spread upon their records, and a copy of the same forwarded to Mr. Ives, for his gratuitous presentation of the sketch to the State. A model in plaster of Paris was prepared by Mr. Wehner, to whose genius as a sculptor is due the perfection of features, proper expression, and graceful proportions of the figures forming the remainder of the group, which is now being cut by an experienced workman, and will be placed in position before the close of October. The figure representing Michigan, as already described, stands in a position of invitation to Commerce at her right hand, represented by a female figure sitting upon a bale of merchandise and surrounded by appropriate commercial emblems, and to Agriculture at her left, also personated by a female, with the various implements and products of husbandry, while at the extreme ends of the group, Mining and Lumbering are properly presented, -- forming as a whole a beautiful collection, entirely original, and faithfully portraying Michigan and her varied interests. . . . . "L.T. Ives of Detroit has presented to the commissioners a sketch of statuary, designed for the pediment of the new capitol, which was considered at the above meeting of the board. The group is composed of three figures, representing Michigan in the center and Agriculture and Commerce on either side. The tools of the miner and woodsman are introduced, and the whole is a happy combination, purely original and characteristic. The commissioners passed a resolution, thanking Mr. Ives for his beautiful sketch, which will be modeled by Mr. Wehner." From the . . . . .
Tympanum - n. architecture, triangular face of pediment; space within arch. Pediment - n. triangular space at end of gable, especially ornamented; such space over a door or window. 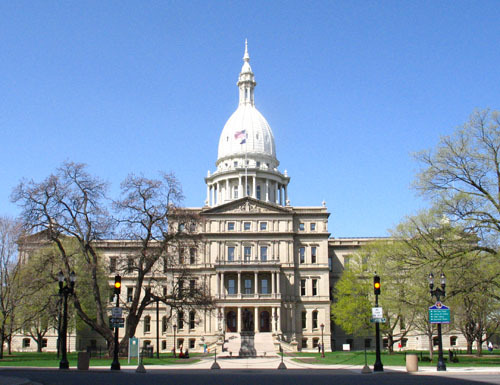 Among the embellishments the Michigan's capitol commissioners approved in the winter of 1876 were the carvings for the eastern tympanum, or the inner, triangular section of the pediment that projected on the highest part of the roof, just below the base of the dome. A Detroit sculptor, Herman Wehner, had been employed to make a model in plaster for the board's approval, and this was presented to them on January 25, 1876. Wehner worked in a room in the capitol, presumably a first-floor room on one of the north corners that had been temporarily closed in as a studio, and here he prepared a half-scale model in plaster of what he proposed for the tympanum. First the commissioners, then interested legislators, came to inspect. Wehner, invited to the job, had come to Michigan with his family from Prussia as a child. As a youth he had worked as a mill hand to help support his widowed mother. When he showed a proclivity for carving, he attracted the attention of a rich patron, who arranged for him to study in Newburgh, New York, under Henry Kirke Brown, the Massachusetts-born sculptor of the equestrian George Washington in Union Square, New York, still considered Manhattan's most successful piece of outdoor sculpture. Only two years before, in 1874, Brown had completed the equestrian statue of General Winfield Scott at Scott Circle, Washington, D.C., cast from bronze cannon captured during the Mexican War. Wehner may well have worked on this while an apprentice in Brown's New York studio. Wehner's initial plaster model for the capitol project featured a Native American woman, representing Michigan, standing in the center, with shield and dagger. To her left was the famous "boy governor," Stevens T. Mason, elected to Michigan's highest office in 1835 at the age of twenty four; on her right, on a log from a fallen tree, the hardy pioneer, with his ox, symbolizing both the settler and the lumber industry. The composition incorporated a sheaf of wheat, symbolizing agriculture; a stack of books and a globe, for advanced education in the state; a pick and space to show mining; and a schooner and locomotive for commerce. A reporter praised the "suggestive beauty and harmony" of this composition. Others, perhaps including the commissioners, felt differently. Lewis T. Ives, of Detroit, produced a rival cartoon, or sketch, of a simpler, more direct concept. He used many of Wehner's ideas; in fact, he had probably consulted with Wehner. His grouping was of three female figures, a standing Michigan flanked by the seated Agriculture and Commerce. Plows, pickaxes, and other tools to support the themes were placed about their feet. This approach seemed to suit everybody, so Wehner was directed to follow Ive's cartoon. (The design was referred to on occasion as being by Wehner and Ives, but the commissioners' contract was with Wehner alone.) In the final version the central figure is a female in Native American regalia, resolute to show that she, Civilization, is emerging from the wilderness era of Michigan and heralds a glorious future. The central figure, a woman in Indian dress, represents Michigan, Indian weapons, which she has cast away, are lying to her side, and in her right hand she holds a volume which she is offering to her people. At her right hand are a globe and evidence of the arts. On the left of the central figure is a seated female who represents agriculture. Her right hand holds a horn of plenty with the fruits of the land rolling from it. In her left hand she grasps a laurel wreath, her arm rests on the handles of a plow. Agricultural symbols are around her. The rock with tools indicates the State's mining interests. On the right of the central figure is another female who represents commerce. She is seated upon bales of goods with her right arm resting on an anchor. A partly constructed vessel is in the background. Michigan's lumbering interests are represented by a chained log, an ax in a stump, and bundles of shingles.